Well this year turned out to be a bit crazy! Life has been pretty busy for me since the end of May, and I really haven't gotten as much sewing done as I wanted to this year. Thankfully my craft room is up and running for the most part. It's not completely organized yet, but it's good enough to do a few projects. We were building a house this summer, but then we decided at the last minute not to move. So all that stuff I had to pack had to be unpacked. It was a bit of a headache! I took that opportunity to donate probably 3/4 of my fabric stash I had been hoarding. My tastes have changed over the years, and I realized that I was holding onto stuff I probably would never use. So I found out that one of the churches in my area sews stuff for Little Dresses for Africa and I donated like 5 medium sized moving boxes of fabric to them. I know they will put it to good use! And it feels good to get rid of some of the excess stuff in here! So now that I have my streamlined stash, I'm working on building up my solid Kona Cotton stash. I'm hoping to eventually finish my 100 Modern Quilt Blocks from Tula Pink. I started a sew-along in the spring but only got up to about 23 completed blocks before life got hectic and I couldn't keep up with it anymore. Below are the first 15 that I finished. I'm using different Kona Cotton solids with a constant smoke grey mixed in. My goal is to use as many possibly Kona colors as I can! 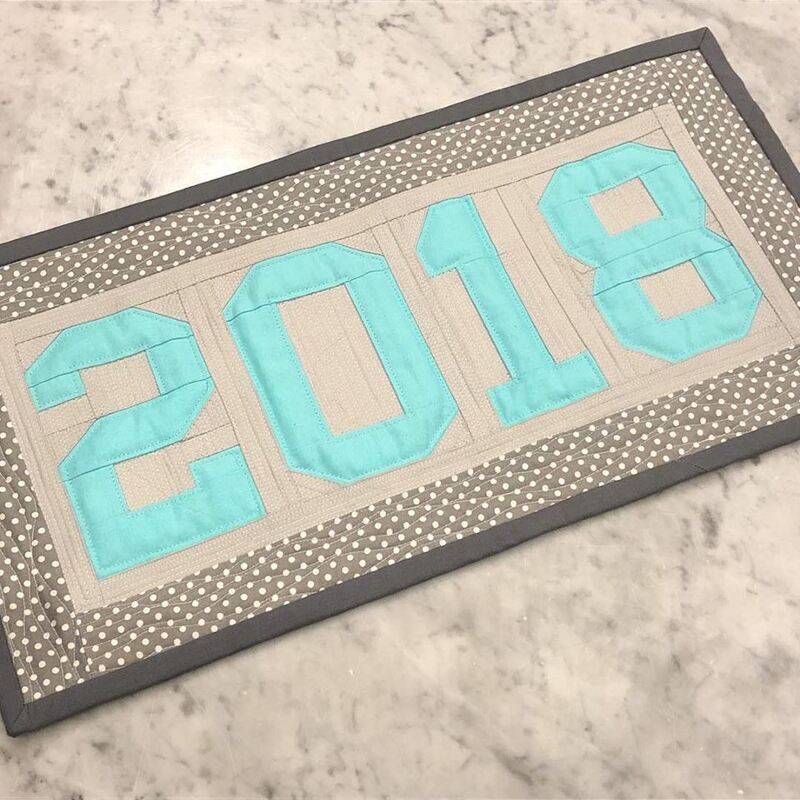 I wanted to do a fun last (and quick) project for 2018, and I decided I wanted to make myself a mini quilt with 2018 on it. I've been into paper piecing lately, so I decided to try my hand at designing and came up with this 2018 block. So in a couple days I worked on sewing it little by little and finally got it finished last night...well, I was hand sewing the binding on at the NYE get together we went to. I think it came out super cute! I used Kona Ash, Azure, and Steel fabrics with Aurifil dove grey and light turquoise thread. I designed it in 3 different sizes. This was the medium-sized one. The number block itself is about 6" x 15" and finished it's around 9 x 17.5" with the boarder. I've put the pattern up on Craftsy for free. You can get it HERE. It's my very first pattern on Craftsy! Yay! I hope people like it. I'm hoping to put some patterns up to sell this year.